Fresh off the best and most contentious win of his 13 years in professional boxing, Saul ‘Canelo’ Alvarez is set to enter uncharted territory as he attempts to claim world honours at a third weight class. At 5’8”, Alvarez seems out of his depth at the Super Middleweight limit, home to many fighters at or above 6ft tall. That includes the 6’1” Rocky Fielding, the WBA’s ‘Regular’ champion, who defends his belt in the dream location of Madison Square Garden, New York. Rocky is fresh off upsetting the unbeaten Tyron Zeuge via technical knockout in the 5th round. Zeuge never looked right from the first bell, but a competent Fielding made the most of his opportunity, never losing sight of the goal that seemed so far away 3 years ago. Back in November of 2015, Alvarez was establishing himself as the face of boxing, defeating the great Miguel Cotto. Meanwhile Fielding’s unbeaten ledger crumbled in one round, when Liverpudlian rival, Callum Smith tore through Rocky inside the opening three minutes. While Alvarez 50-1-2(34KO’s) made his way towards a pair of goliath matches with Gennady Golovkin, Fielding pieced his career back together, before he clinched his golden ticket in July this year. For Alvarez this is no more than phase two following his career defining win over Golovkin. Meeting Fielding 27-1(15KO’s) is a legacy builder, one where the opponent he faced will matter far less than the statement he makes as a former Welterweight contender beating a fully-fledged world class Super Middle. But victory is no guarantee for Alvarez this weekend. The Mexican superstar makes his maiden appearance at The Garden, and for all his advantages across the board, it could all come unstuck if Fielding’s size proves a problem. 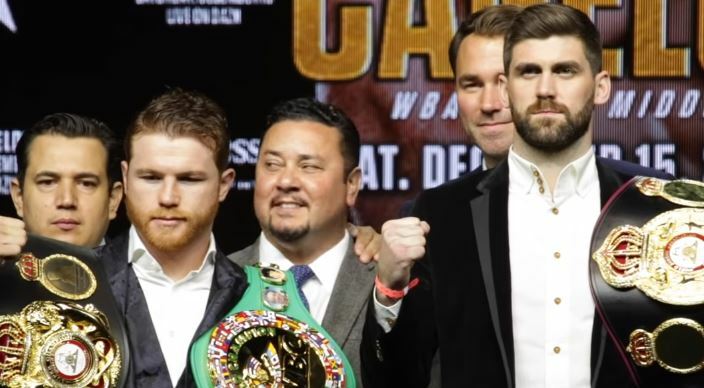 The weight on the night is unlikely to be a factor – Canelo has grown a reputation for pilling on the pounds post weigh-in – but height and reach advantages of such proportions can prove difficult to overcome for even the best of boxers. Win, draw or lose, Alvarez’s venture to 168lbs may be short lived. But after 53 fights, it is hard to blame Alvarez for becoming bored of the norm and taking risks to elevate his status. For Fielding he must fight with the same freedom mixed with urgency that he showed when ousting Zeuge. An opportunity like this could well be a one-off, but the reality of winning should not be seen as a wild fantasy. There is a real chance here, but perfecting the game plan is essential against one of modern boxing’s finest. The advantages that Rocky has will be glaring at the opening bell, but they will fade very quickly as Alvarez quickly derails Fielding’s hopes of a huge upset win. Unfortunately for Fielding it is just hard to envision him having much of an opportunity to impose himself in this fight. Alvarez has met so many different styles over the years, and with a win over Golovkin in his sails, his confidence has sky-rocketed. This could well be over very quickly, as Canelo proves too strong, too quick and altogether too good for the brave Merseyside champion. After a few rounds of limiting Fielding’s advantages, Alvarez will begin to press home with combinations downstairs, before teeing off with heavy right hands around the guard of Fielding. Marked up, Rocky will take his chance of further imposing his size on Alvarez, having had little success boxing from the outside. But that will only further the punishment he receives from the 28-year old challenger. The pick is for the curtain to be closed in the same round that it was hoisted wide open by Fielding in July, as a sickening body shot drops Rocky. The end will come with the towel from Rocky’s corner or the referee taking decisive action. Win number 51 for the flame-haired Mexican, and as the next chapter opens up there remains plenty more in store for boxing’s most lucrative asset.